There is much focus today on children’s emotions. Constructs like emotional intelligence, emotional self-regulation, emotional well-being and emotional social learning are being bandied about like never before. Emotion, long dismissed as a nuisance factor, is now confirmed to be at the core of development and well-being. Yet little is being taught about the nature of emotion or the implications for parenting and teaching and treatment. In this course, Dr. Neufeld does a brilliant job of putting the pieces together to make sense of emotion, revealing the emotional roots of many behavioural problems, and clarifying the challenges for parents, teachers and helping professionals. This material is absolutely foundational to an understanding of human nature. New revelations about the nature of emotion have shed fresh light on the pivotal role of feelings in play, brain development, discipline problems, attention problems, mental health issues and much more. In this course, Dr. Neufeld distils the current scientific knowledge on emotion to three basic laws and discusses the implications of each of these laws for parenting and teaching as well as the treatment of children. Neufeld also outlines five basic steps to emotional health and development so adults can foster emotional well-being and get to the root of such problems as alarm, anxiety, agitation, aggression, impulsiveness, lack of empathy, bullying, and so on. This course is powerful in the insight it provides as well as the changes it inspires. The emotion course is formatted into six sessions with one hour of instructional video for each of the first five sessions and 1.5 hour of instructional video for session 6. . The first of the three laws of emotion is that emotion seeks expression. All emotions have a purpose that becomes thwarted when expression is denied or distorted. The two over-arching tasks of emotion are to bind us together and to grow us up. Although expression is spontaneous, impediments can be encountered. The most serious impediment is when emotional expression adversely affects attachment. The adverse consequences of thwarted expression is discussed under five main topics: emotional dysfunction where emotion cannot do its work, distorted or displaced expression, depression as in flattened affect, failure to adapt to life circumstances, and troubling eruptions of emotion. The first challenge in dealing with problems rooted in emotion is to facilitate the expression of emotion without repercussion to a child’s working attachments. The second law of emotion is that emotion seeks consciousness. Feeling is the conscious tip of emotion. The fundamental importance of feeling is explored. Major impediments to feeling include lack of emotional expression, lack of heart language, and emotional defendedness resulting from hurt feelings. Unfortunately many children lose their feelings with dire consequences for their functioning and development. Our challenge for such children is to help them get their feelings back. The third law of emotion is that emotion seeks equilibrium, resulting in balance, stability and self-control. The mixing of emotions can only happen if emotion is first expressed and felt. The role of the prefrontal cortex is discussed as well as impediments to this spontaneous developmental process. Mixed feelings are explored as the prerequisite to courage, patience, empathy, reflection and self-control. The ultimate challenge for adults is to help children find their mixed feelings. The five stages in emotional development are outlined, with the challenges for children and adults in each stage. The primary pitfall of well-meaning adults is to focus on the developmental outcome rather than the process by which children get there. When it comes to emotion, rewarding or focusing on the desired end result will actually backfire, often resulting in deeper emotional problems. The challenge when children are stuck is always to start at the beginning where root problems exist. Emotion has been eclipsed by such constructs as learning, discipline, disorder and even disease. Emotion has also been eclipsed by our focus on behaviour, reason and self-regulation. Only when we begin to reframe problems in the language of emotion can we find a way through. Various problems are looked at to illustrate the issues involved, including attention problems, anxiety problems, bullying and aggression. 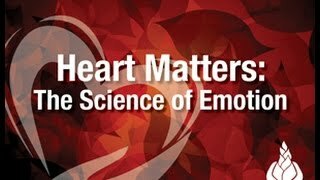 The tuition fee for taking Heart Matters: the science of emotion through continuing education is $200 CAD. This includes a virtual campus student pass of four months to access the videocourse material as well as other supporting materials. If a personal copy of the DVD set is desired, the tuition fee is $275. Dr. Deborah MacNamara has been a member of the Neufeld Institute Faculty since 2009. She comes to this role with a strong academic background, teaching experience in university, as well as a professional involvement in treatment. She is in high demand as a speaker and presenter and highly respected as a teacher.